Modern, Stylish and Easy to Maintain – Our Conservatory Sails offer a practical solution to glare and conservatory overheating. Our conservatory sails use a combination of custom designed stretch fabric panels to reflect unwanted heat and provide much-needed shade during the summer months. 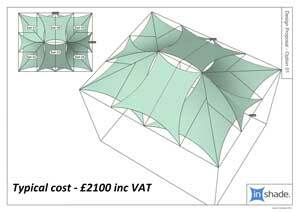 Inshade Conservatory Sails are manufactured in the UK using an exclusive, high performance solar control fabric which reduces heat gain, provides shade and reduces the effects of the suns harsh rays. InShade stretch fabric conservatory sails are a modern, efficient way to control heat gain and glare in your conservatory, transforming your conservatory into the perfect summer space.The sails have a patented tension edge which keeps them taut when installed, they are easy to remove and clean, they are manufactured from premium quality materials with top quality stainless steel fittings plus they are backed up with our no quibble 5 year guarantee. 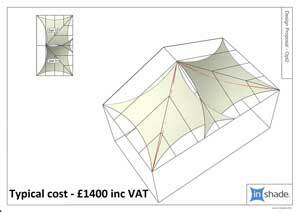 All the conservatory sails we supply and install are specifically measured and manufactured to fit your conservatory perfectly. Very good service all round, courteous, prompt, efficient and pleased with the result. 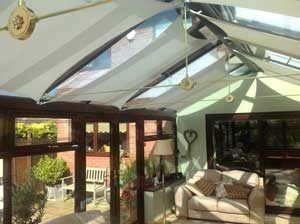 Conservatory Sails fitted, excellent service, expert advice, quick and efficient. Communication first class, definately recommended. 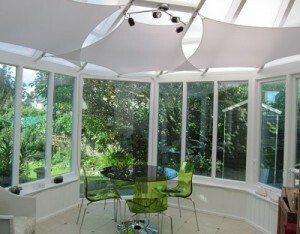 ISX is a unique high performance, durable and washable solar control fabric which is UK manufactured and which has been specifically developed to withstand the extreme temperatures found in conservatories. The ISX standard range which comes in a range of subtle natural colours all of which offer best in class solar performance in providing heat control and reducing glare. The ISX Duplex range which has a white reverse side which further enhances the solar performance plus it enables the introduction of dark colour sails without compromising on the sola performance. A colour match service is available (subject to a minimum order) which allows you to match the colour of your sails to your interior design or favourite colour. 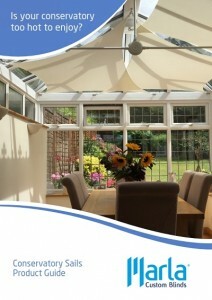 The design of your conservatory sails can be as simple or as complex as you wish. You may wish to cover just one elevation, several elevations or all elevations of your conservatory with anything from just 2 or 3 sails through to maybe 10 or more. As you adjust the design, so you adjust the costs and this can be seen instantly during the design process. Some typical sail designs and costs. We offer a truly unique and personal survey, design and installation service from start to finish. Initial site survey – we carry out an initial survey where we will take approximate measurements, show you the fabrics, discuss the options available and answer any initial questions you may have. Design – you will log in to our design computers and guided by one of our expert designers you will select your conservatory design and then start to create the ideal design that suits both your requirements and your budget. 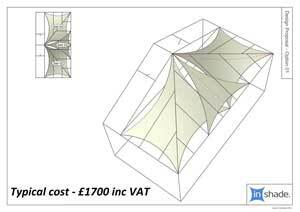 Throughout the design process as you adjust and refine your design you will be able to see how this affects the performance, look and cost of your design. 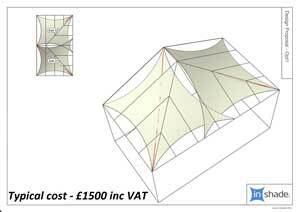 The design process takes on average 30 to 40 minutes and at all times you have the assistance of one of our design experts who will offer advice and support as you design your conservatory sails. Quotation – Once you have completed your design and are happy with the final result we will send you a written Quotation based on your design and the fabric you have chosen. Manufacture survey – Once you have accepted your Quotation we will return to your conservatory to mark out exactly where the fixings will be positioned to ensure that your design is replicated in your conservatory. Installation – approximately 2 weeks after us carrying out the manufacture survey our fully experienced installers will return to install your bespoke conservatory sails.